Can't say enough good about this dog. 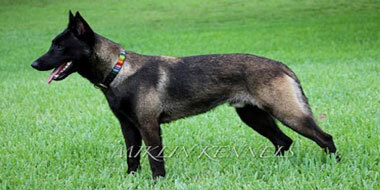 He has incredible structure, very social but is a fierce protector when strangers approach. Bo is very clear-headed and is easy to train and work with, he always gives 150%, he has a full hard grip and won't quit. We have bred 3 of our females to Bo and all have turned out incredible, most with the dark sable color, black heads, legs, and chest. He is line bred on one of the best producing dogs from France, Cartouche, who was brought her by Ludovic Teubane and is now in Mexico. 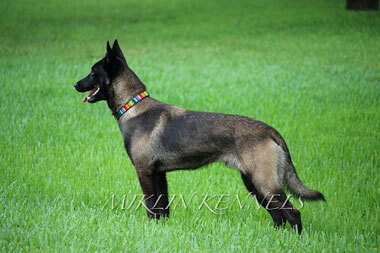 MikLin Kennels is a small breeder that breeds Belgian Malinois and working German Shepherds for police, sport, personal protection or just family pets. All of our puppies are AKC registered and are family raised. We believe in early socialization and human imprinting.
" I recently purchased a puppy from Mike. She arrived in perfect health and good spirits, All of my expectations were filled from personality, confidence level, intelligence even color. " " Mike's knowledge and care in picking some of the top producing working dog bloodlines in the world is a tribute to quality shepherds and a preservation of the old school working dogs. " © Copyright 2019 MikLin Kennels.